TTI Success Insights announces the launch of Professional Services, formerly Business Services division, and subsequent reorganization in order to accelerate the execution of the company strategy, effective immediately. Adam Wong, currently Vice President of North American Distribution, will become Senior Vice President of Professional Services. Wong’s responsibilities will include assisting the organization’s network of Value Added Associates to strengthen their relationships with existing clients and drive their relationships to the next level. 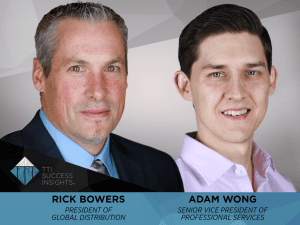 Rick Bowers, currently President of TTI Success Insights International division, will become President of Global Distribution and assume responsibilities for North American and International Distribution. “I am proud of what I have accomplished during my time as the Vice President of North America and am confident that this new role and centralization of distribution under Rick Bowers will lead to increased profitability for our business and the businesses of each Value Added Associate,” said Wong. All other divisions within the company will remain unchanged.